In addition to the more familiar red and white clovers, we carry several other species of clover and legumes that can be used as forage, cover crop, green manure, or for wildlife habitat. Yellow blossom sweet clover can provide ample nitrogen along with large amounts of bio-mass which makes it useful in building up marginal soils. With proper management, it can also be used as forage. Alsike clover does well on soil that is wetter or has a lower pH where alfalfa or red clover may not work as well. Berseem and Crimson clovers are considered warm season annuals that will provide emergency forage or will work well as a cover crop following a small grain. White blossom sweet clover is often used as a pollen source for beekeepers Birdsfoot Trefoil is a non-bloating legume component in permanent pastures. Small Burnett, Lespedeza, and Sanfoin are legumes that can be used to improve the quality of pastures or wildlife food plots. Crown Vetch works well as a ground cover on slopes. If you're considering a clover or other legume in your crop rotation, please call us or send an email. We can help answer your questions and find something that will work for your situation. For specific information on growing and managing clover, please check out the Agronomic Basics below. Birdsfoot trefoil is a moderately long-lived herbaceous perennial legume. It has a well developed, branching, tap-like root with side roots near the soil surface. Spreads by underground rhizomes. Most cultivars are erect and grow to a height of 2 to 3 feet. The stems are slender, branch well, and are moderately leafy. Leaves are smooth and consist of 5 leaflets. The bloom is made up of a cluster of bright yellow flowers. The plant remains green and succulent during and after seed ripening. Trefoil is a good fit where soil is to acidic or poorly drained for alfalfa. It is a good forage crop that can be planted alone but is usually mixed with grasses. Birdsfoot trefoil is an excellent choice for pastures that will be left down for long periods of time (ten years or more) or for pastures that are difficult to plow or cultivate. It does not cause bloat and can survive under continuous grazing. It is slow to get established and will generally not blossom till the year after seeding. Once established it may become invasive in some regions or habitats and has the potential to displace desirable vegetation if not properly managed. It may lodge if allowed to grow tall. Trefoil can be used for green chop, hay and pasture but is not recommended as a hay crop for northern growers because it will not produce as much tonnage per acre as alfalfa or red clover on fertile well-drained soil. Birdsfoot trefoil is a good ground cover that is used along roadsides to control wind and water erosion. It provides green cover most of the year and blooms profusely. To ensure adequate root nodulation for nitrogen fixation, Birdsfoot trefoil seed should be inoculated with Rhizobium bacteria. Plant 2 - 4 lbs per acre in a mix. Birdsfoot trefoil is suited to low and moderately fertile soils with relatively poor drainage but is usually less productive than alfalfa on fertile, deep, well-drained soils. Top-dress regularly with phosphorus and potassium – usually at 30# per acre annually. Birdsfoot trefoil produces 20% more growth after July 1 than most dry land and grass/legume mixtures. Trefoil starts spring growth later than grasses. Grazing the grass early then removing livestock until Trefoil is well established, will help maintain vigorous trefoil stands. 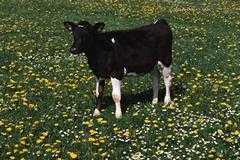 Do not graze closer than 3 - 4 inches so plant can maintain photosynthesis. Remove livestock by September 10 and allow 5 - 6 weeks growth before final grazing. This will allow carbohydrate storage for winter survival and spring growth. Trefoil must be allowed to grow to maturity every third year or so in order to produce a seed crop. This is critical to maintain a long-term stand. Maintaining dense, competitive forage is important in preventing weed problems. The stems do not terminate in a flower as they do in red clover. Alsike clover is used for hay, pasture, and green manure. Alsike clover is associated with photosensitization in horses which causes a negative reaction to light, and with big liver syndrome which may cause liver damage. Alsike clover can be frost seeded into existing grass pastures in early spring. The freeze-thaw cycle will incorporate the seed into the soil. To ensure adequate root nodulation for nitrogen fixation, clover seed should be inoculated with Rhizobium bacteria. Plant 1 - 3 lbs per acre in a mix or 5 - 8 lbs/acre as a plowdown. As a legume, alsike clover fixes atmospheric nitrogen with Rhizobium bacteria in its root nodules so additional nitrogen fertilizer is generally not required. Be sure the seed is treated with the proper inoculant before planting. If your soil is very acidic (pH 5.0 or lower), nodulation may be reduced and extra nitrogen may be necessary. Consult Tables 3 and 4 on this website for Phosphorus and Potash recommendations. Pre-plant fertilize according to a soil test. Used primarily as livestock forage and as a nitrogen plowdown in crop rotations. Berseem clover does best on medium loam soils. It is not as drought tolerant as alfalfa. The most tolerant of wet soil conditions of all clovers and is well adapted to alkaline soils. Can fix 100 - 200 lb. N/acre as a winterkilled cover crop before corn or other nitrogen-demanding crops. Tolerates close mowing and recovers rapidly after mowing to allow for multiple cuttings. Average to high protein and digestibility with low bloat potential. Seed with oats to maximize total dry matter and protein. Does not re-establish, so requires annual sowing. At 60° F, will be ready to cut about 60 days after planting. Must be cut before blooming or it will not recover. Seed after April 15 in Wisconsin and Minnesota to reduce risk of crop loss due to late frost. Seed early- to mid-April in Iowa. In the Corn Belt, it can be planted in mid-August to provide winter erosion protection. Can be over-seeded into standing small grain crops about three weeks after germination or after the tillering stage in winter grains. Can be established as a pure stand, with a small grain cover crop, or seeded into a grass sod. Seed should be inoculated with the appropriate Rhizobium bacteria (Type R) to ensure adequate root nodulation for nitrogen fixation. Drill about 12 - 15 lbs/acre or 15 - 20 lbs per acre if broadcast. Seed no more than ½ inches deep. Cultipack or roll because good seed-to-soil contact is essential. Fertilizer needs of Berseem clover are similar to those of alfalfa. Fertilize with 60 to 100 lb. Phosphorus/acre if soil tests indicate deficiencies. Boron deficiencies can limit growth. Maintaining a dense and competitive forage is important in preventing weed problems. There are few disease or insect problems associated with Berseem clover in the Upper Midwest. Clip 30 to 60 days after planting when plants are 10 inches tall and basal shoots begin to grow. Timeframe will be dependent on weather, field and moisture conditions. Thereafter, mow every 25 to 30 days to encourage regrowth. Leave at least 3 to 4 inches of stubble because plants regrow from lower stem branches. Green chop a small grain/berseem clover mixture at the pre-boot stage to prevent the clover from going to seed. Berseem must be cut or grazed before it blooms or it will not recover. Crimson Clover (Trifolium Incarnatum L.) is a summer annual legume used primarily as livestock forage, as a nitrogen plowdown in crop rotations soil, or for erosion prevention. Primarily used in southern half of the U.S. Prefers loam soils with good drainage. Avoid using it on poorly drained soils due to potential disease problems. Can tolerate pH ranging from 4.8-8.2 but does best at pH of about 6.5. Provides good groundcover and weed control as it fixes nitrogen and scavenges nitrogen from the soil. Often grown with cereal grains or annual ryegrass. Will regrow if grazed or mowed no lower than 3 or 4 inches before the early bud stage. Mixing with grass reduces its relatively low bloat risk even further. Can produce 1,500 lbs/acre dry matter and up to 80 lb. N/acre. Plant in early May as soon as danger of frost is past. Seed germination and seedling survival require cool night temperatures (less than 60°F). Can be over-seeded into corn when corn is 16 to 24 inches tall. Plant at a rate of 15-20 lbs/acre, (Crimson clover has larger seed than most clover). Use the lower rate in cool soils and the higher rate in warmer soils. Drill at a depth of ¼ to ½ inch. If broadcasting, use higher rate then drag or roll. Soil firmness and good seed-to-soil contact are essential. To ensure adequate root nodulation for nitrogen fixation, seed should be inoculated with Rhizobium bacteria (Type R). Be aware of chemical restrictions when following other crops. Crimson clover is adapted to low fertility soils. Application of phosphate and potash fertilizers may increase production if soil tests indicate deficiencies. In general, crimson clover is tolerant of weeds. Often used for livestock grazing or hay, a Nitrogen plowdown cover crop, soil builder, or a beneficial insect attractant. Use caution when feeding sweetclover hay or silage. Sweetclover hay stored too wet will mold and may cause Sweetclover Bleeding Disease which can cause animals to bleed to death from slight wounds or internal hemorrhages. Spring is the best time to plant sweetclover because moisture conditions are most favorable for rapid seed germination and seedling establishment. Sweetclover grows slowly for the first 60 days after planting. Unlike alfalfa and other clovers, late summer and fall seedings are not recommended because sweetclover must develop an extensive root system and store energy reserves during the fall growth period. If a late season seeding is necessary, plant at least six weeks before frost so roots can develop enough to avoid winter heaving. In the Corn Belt, drill 8 to 15 lb/acre or broadcast 15 to 20 lb/acre, using the higher rate in dry or loose soils or if not incorporating. Plant 1/4 to 1/2 inch deep in medium to heavy textured soils (slightly deeper in sandy soils). Press wheels or cultipacking will improve the seed-soil contact and the chances of obtaining a good stand. To obtain a proper seeding depth, the seedbed should be firm. Seeding too heavily can result spindly stalks and increase lodging which can lead to disease problems. Sweetclover will fix nitrogen if inoculated properly. No herbicides are labeled or approved for use on either seedling or established sweetclover.